Freshly picked fruit will taste better and last longer if you treat it well! These tips will help you make the most of your summer fruit. Clean, dry, shallow plastic containers are ideal to pick fruit into. If you have lots to pick, we offer sledges and trollies to help you move your filled containers around the farm. 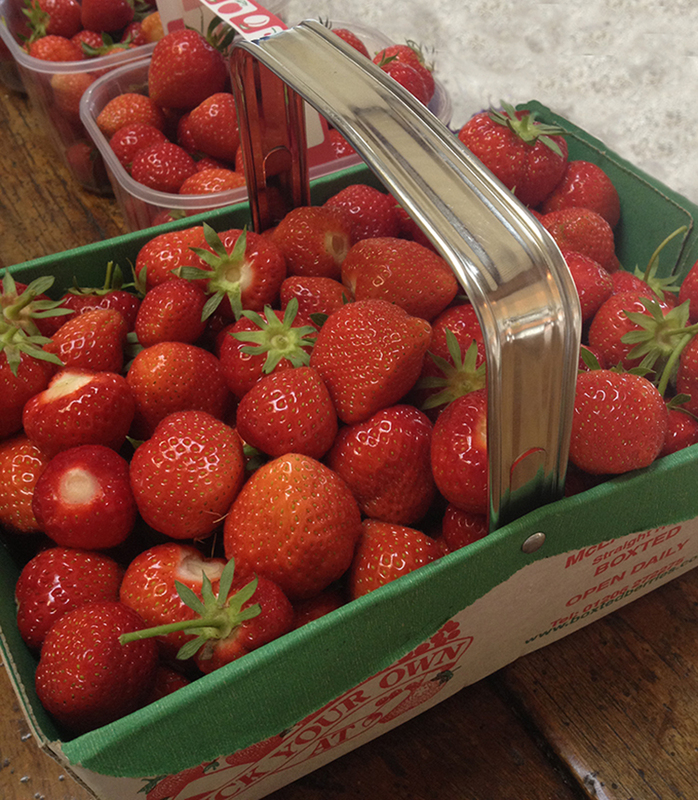 You can pick strawberries into medium-depth containers, as long as you treat them gently. You can pick jam strawberries into any container big enough. Hold the strawberry in the palm of your hand and pinch the green stem between your finger and thumb. This will leave in the plug (the green, leafy bit) – essential for making the fruit last longer. Take strawberries out of the fridge at least 15 minutes before eating as they lose their flavour when cold. To enjoy later in the year, puree the fruit and freeze; add the defrosted puree to yoghurt and smoothies, or make into sauces and ice cream. Defrosted whole strawberries still make great jam and smoothies. Strawberries do not hold their shape after freezing. However if frozen like this, strawberries keep beautifully and do not go mushy. Line the bottom of your container with a sheet of ‘easy-leave’ polythene tissue. Slice strawberries and put a layer just overlapping each other. Sprinkle the strawberry slices with caster sugar (granulated sugar also works). Continue layering the easy-leave tissue, strawberries and sugar until the container is full. Thanks to Sandra Johns from Chester for this information. Picking into small, shallow containers will make sure the raspberries don’t squash. Ice cream tubs with lids are ideal containers as you can out these straight in the freezer after picking. Handle raspberries gently, like eggs: place them carefully into your container, don’t drop them. Ripe raspberries slide from the plug easily; if you need to tug the fruit to pick it, it’s not ready. The best fruit is usually hiding under the leaves. Tying a basket round your waist will leave your other hand free to brush the leaves aside while picking. Gooseberries are a sturdy fruit so you can pick them into any sized container. Don’t bother to ‘top and tail’ the end of the fruit before freezing; it’s easier to do so when they’re frozen, with rubber gloves on. If you bother at all – we don’t! Wear gloves while you pick to protect your hands from the thorns.There are milk crates dotted about for you to sit on whilst you pick. We keep the nets over the bushes to stop pigeons eating the fruit. Gently lift the net to pick and please replace afterwards.